While escorting a B-66 north of Hanoi on December 2, 1966, Col. Cordier’s F-4C Phantom took a direct hit from a surface to air missile (SAM), forcing him to eject. He was captured immediately and held in four different prisons in and around Hanoi until his release on March 4, 1973. Born and raised in Ohio, Col. Ken Cordier holds a bachelors’ degree in Mechanical Engineering from the University of Akron, and a masters’ degree in Business Management from Troy State (Alabama). His professional military education includes Squadron Officer School, the Armed Forces Staff College, the National Security Management Course and the Defense Attaché School. 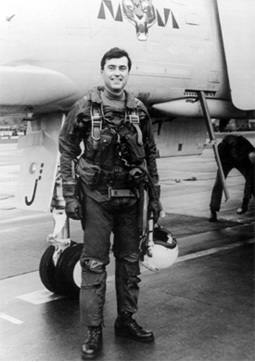 In 1963 Col. Cordier graduated from pilot training at Del Rio, Texas and was assigned to MacDill Air Force Base, Florida, flying the F-4C “Phantom.” In 1965, he deployed to Ubon Royal Thai Air Force Base, Thailand, where he flew 59 missions over North Vietnam and Laos. The following year, in July 1966, Col. Cordier volunteered to fly another tour at Cam Ranh Bay Air Base, Republic of Vietnam. He then brought his combat record to 175½ missions and more than 500 combat hours. On December 2, 1966, Col. Cordier’s Phantom took a direct hit from a surface-to-air missile, forcing him to eject approximately 85 miles north of Hanoi. He was captured immediately and held in four different prisons in and around Hanoi until his release on March 4, 1973. Returning to active duty after four months convalescent leave, Col. Cordier attended the Armed Forces Staff College and re-qualified to fly jet aircraft. Over the next 12 years, Col. Cordier served in a number of flying and staff assignments, culminating with a tour of duty as Air Attaché to the United Kingdom. Col. Cordier retired from the Air Force in 1985 and returned to the United States where he represented British Aerospace in Washington D.C. as Director, Military Aircraft. Since moving to Dallas in 1993, Ken has been self employed as a management consultant and has partnered with his wife in building her Mary Kay sales organization. He has served in leadership positions in several veterans’ organizations, and is a frequent speaker on the subject of his experiences as a prisoner of war (POW). During the 2004 Presidential campaign, Col. Cordier, along with several fellow POWs, appeared in the film Stolen Honor. Colonel Cordier is a Command Pilot with more than 2,000 flying hours flying time in fighter aircraft. His combat decorations include: the Silver Star with one oak leaf cluster, the Legion of Merit, the Distinguished Flying Cross, the Bronze Star with combat “V” for valor, the Air Medal with six oak leaf clusters, the Prisoner of War Medal, and the Purple Heart. In 1998, he was awarded the prestigious Daughters of the American Revolution DAR Medal of Honor, and in 2008 he was inducted into the American Combat Aviator Hall of Fame.